On Friday, October 12th 2018 the international auditing firm Ernst & Young honored outstanding entrepreneurs with the EY Entrepreneur Of The Year Award for the 13th time in Austria. Katharina List-Nagl of F/LIST was named the winner in the category Industry & Hightech, and will represent Austria at the World Entrepreneur Of The Year Award 2019 in Monte Carlo. The EY Entrepreneur Of The Year counts among the world’s most well-known awards for entrepreneurs. For more than 30 years, EY has honored entrepreneurs in 60 countries for exceptional achievements. In the category Industry & Hightech Katharina List-Nagl, who is running F/LIST in the third generation, convinced the expert jury of her merit. The owner and CEO of the internationally renowned manufacturer of interiors for business & private jets, yachts and residences headquartered in Lower Austria was chosen among 15 finalists. The high-profile expert jury selected the winner based on five criteria: entrepreneurial performance, business development, innovative power, leadership and future sustainability of the company. On top of that Katharina List-Nagl was chosen as the Austrian representative at the EY World Entrepreneur Of The Year 2019 in Monte Carlo. „Katharina List-Nagl is an outstanding entrepreneur who is living proof that down-to-earth leadership and a keen sense for luxury do not contradict each other. Today F/LIST is a global family-run company due to her entrepreneurial skills and her passion. We are delighted that Katharina List-Nagl will represent Austria at the EY World Entrepreneur of the Year 2019 in Monte Carlo,“ says Erich Lehner, Program Partner of EY Entrepreneur Of The Year in Austria. After being named a Winner in the German Design Award 2018, which rewards outstanding product design, F/LIST® HEATED STONE FLOORING has won the Winner title in the German Innovation Award, which was established in 2018. This new award tendered by the German Design Council honors products and projects which are true innovations in their fields. In the category „Aviation & Maritime Technologies“ in the class „Excellence in Business to Business“ F/LIST® HEATED STONE FLOORING could convince the distinguished jury of it innovative value. It is the only fully certifiable real stone flooring with integrated heating in the aviation industry and can be heated to any preset temperature between 23 °C and 33 °C (73.4 °F and 91.4 °F), with a low power consumption of only 200 watts per square meter (18.6 W/ft2). Despite the remarkable technical performance the heated stone flooring is only 11.2 millimeters thick (0.44) and only negligibly heavier than the non-heated version, as weight is of vital importance in aviation. Still, the heated stone flooring is just as easy to clean and permanently non-flammable. An innovative fastening system facilitates installation and maintenance which saves time and money. While carpets are prevalent in business aircraft, stone flooring is a hygienic alternative, especially in entrance and wet areas. Due to its high resilience and durability, it does not need to be replaced as often as carpets. Despite its hard surface, F/LIST® HEATED STONE FLOORING passes all noise tests. But its most striking feature is doubtlessly its elegance, which makes it a feature of the cabin’s design; the integrated heating creates a pleasant and livable atmosphere. The German Innovation Award was established in 2018 and honors products and projects across all industries, which stand out through their user-friendliness and added value compared to existing solutions. It makes innovative achievements more visible to the general audience and supports their successful positioning on the market. Only companies nominated by the scouts and board of experts of the German Design Council are eligible to take part in the competition, which guarantees the award’s independence and excellence. The jury is composed of independent, cross-disciplinary experts from industry, science, public entities and finance. Appraisal of the entries is conducted according to the criteria of degree of innovation, user benefits and economic viability. The innovation strategy is expected to consider social, ecological and economical sustainability, as well as resource and energy input. Other factors include potential of location and employment, product life cycle, market maturity, technical quality and function, materials and synergies. In the year of its establishment, more than 650 projects were submitted for the German Innovation Award. F/LIST officially inaugurated the new 59,000-square-foot production facility of F. LIST CANADA CORP. in the Greater Montréal area on May 14th and announced plans to hire up to 100 specialists within the next two years. The Laval facility, which is the largest F/LIST manufacturing plant outside of Austria, represents an investment of more than CAN$20 million for the company, including CAN$10 million by the end of 2018. It provides high-quality wood veneers for business and executive jet interiors, finishing and assembling of interior components, refurbishment of interiors, and product and customer support. The facility also houses a showroom and a veneer selection area as part of its designation as F/LIST’s Veneer Competence Centre for flame retardant wood veneers, key components of its interior finishing business. “We will be serving not only the thriving local market in Canada, but across North America with our quality workmanship and F/LIST spirit,” said Sean Johnson, Chief Executive Officer of F. LIST CANADA CORP. “We are committed to building and growing our presence here, having already invested millions of dollars in specialized production equipment, and recruiting top local talent.” Current positions available include cabinetmakers and veneer specialists, production managers and quality assurance experts. 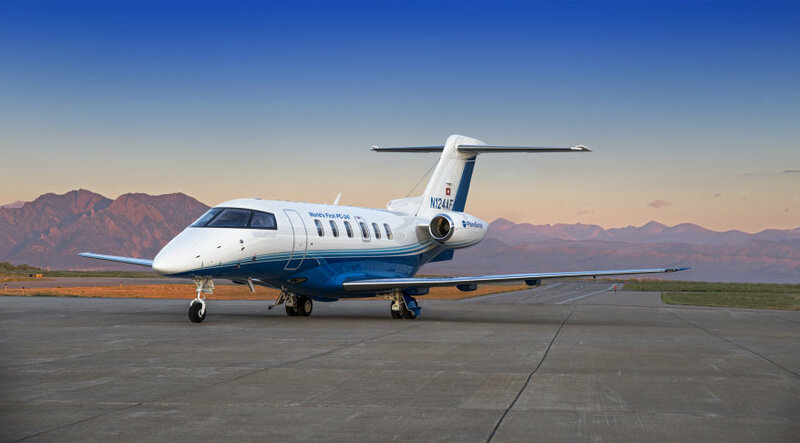 On February 7th the very first Pilatus PC-24 has been handed over to PlaneSense, a US fractional ownership transport service provider. All cabin monuments for this jet came from F/LIST. The cores of the cabinets came from F/LIST’s joint venture HILITECH. Its innovative lightweight composite components contribute to the PC-24’s versatility. F/LIST’s high-end quality, reliability and extensive services have long been appreciated by the Swiss aircraft manufacturer. With the commission of the interior for the first PC-24, the longstanding partnership between Pilatus Aircraft and F/LIST has been strengthened further. F/LIST supplied the interior for entrance and main cabin including lavatory, sliding doors, tables, galley, stone countertops and stone flooring. It is a great pleasure for F/LIST to be on board of the very first of a new generation of “Super Versatile Jets” with its high-end interior products. The PC-24’s main USPs – the versatility of a turboprop with the comfort of a medium-light jet and the performance of a light jet – demanded new ways of thinking in terms of space and weight saving. HILITECH, F/LIST’s joint venture with Hintsteiner Group, provided just that: lightweight carbon composite components, manufactured in a novel process which saves up to 25 % of weight compared to traditional techniques. Moreover, the new process allows for more complex 3D geometries and thus more daring interior design visions to be realized. 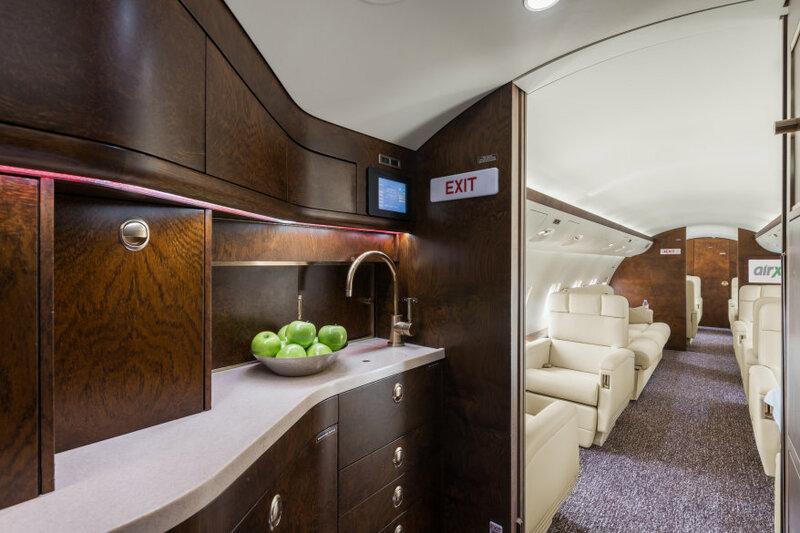 The strong and almost joint-free raw parts are finished with F/LIST’s elegant wood and stone veneers to be fit for Pilatus’s “Crystal Class” standard. The German Design Council annually honors outstanding, innovative projects and products and their creators. After reaching the shortlist of this year’s Crystal Cabin Awards, F/LIST® HEATED STONE FLOORING has been chosen as a “Winner” in the German Design Award 2018. F/LIST® HEATED STONE FLOORING is the only fully certifiable real stone flooring with integrated heating on the market. It can be heated to any preset temperature between 23 °C and 33 °C (73.4 °F and 91.4 °F), with a low power consumption of only 200 watts per square meter (18.6 W/ft2). Despite the remarkable technical performance the heated stone flooring is only 11.1 millimeters thick (0.44“; with a minimal construction height of 17.1 mm / 0.67“) and only negligibly heavier than the non-heated version, which is of vital importance in the aviation industry. Still, the heated stone flooring is just as easy to clean and permanently non-flammable. An innovative fastening system facilitates installation and maintenance which saves time and money. The awards ceremony will be held in the context of the international consumer goods fair Ambiente 2018, which will take place in Frankfurt am Main from February 9th through 13th 2018. 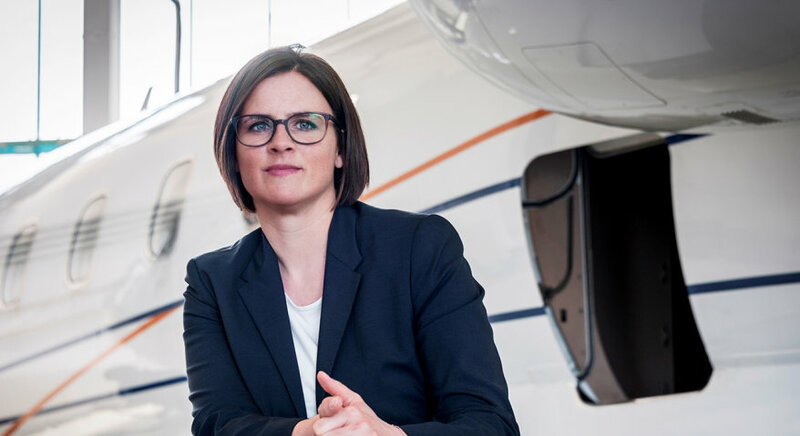 With these words AIR-X sales manager Debbie Camenzuli announced the completed refurbishment of their Challenger 850 with the registration 9H – BOO on LinkedIn. 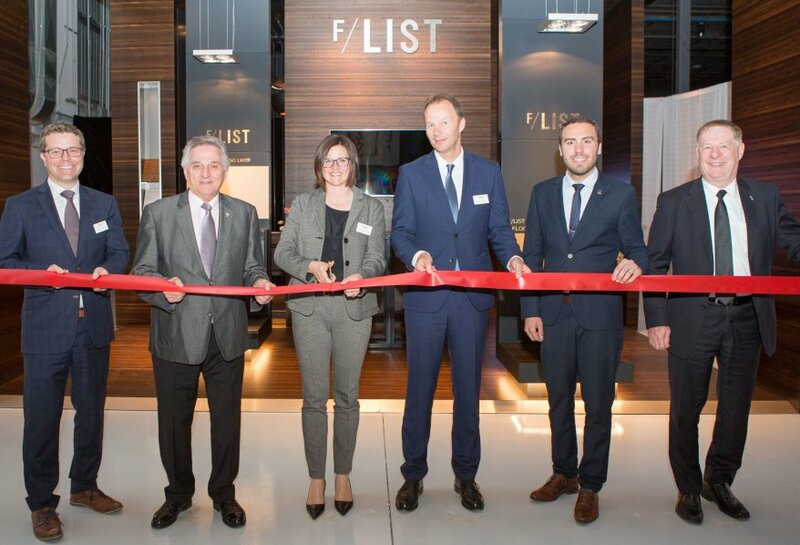 The project for the Maltese air charter company marked the first major refurbishment conducted by newly founded F/LIST GERMANY, which originated from the former OHS Aviation Services GmbH in April of this year. The refurbishment was undertaken in cooperation with F/LIST’s major strategic partner Lufthansa Bombardier Aviation Services in Berlin Schönefeld. In the course of “BOO’s” refurbishment all seats were re-upholstered with elegant cream-colored leather, to match the chic new fabric of the divan. New linings on ceilings as well as on lower and upper sidewalls and new PSU panels added to the clean and elegant overall look. A newly installed grape-colored carpet covering the entire cabin floor offers a sophisticated contrast with the otherwise light, cream refurbished cabin. The elegant matte oak surfaces of the galley, sideledges, bulkhead and partition were reworked to give the interior a completely new and sophisticated touch. All the interior work was performed over a time of approximately six weeks at F/LIST GERMANY’s EASA Part 145 approved upholstery & joinery facilities in Schönefeld, while Lufthansa Bombardier conducted mandatory fuselage and engine checks. Shortly after bringing 9H-BOO back into service, Bernhard Wallner, CCO of AIR-X, said: “Thanks to the F/LIST Team for their great work. The result is amazing. Our customers love the new interior”. F/LIST expects this success to be the first in a line of many more projects to be completed in cooperation with Lufthansa Bombardier Aviation Services and other MROs worldwide.